also enjoy active solo careers, London Winds' performances are renowned for their technical brilliance, interpretative vision and joie de vivre. Founded in 1988 by British clarinettist Michael Collins, the group has rapidly become one of the world's most prominent chamber ensembles. 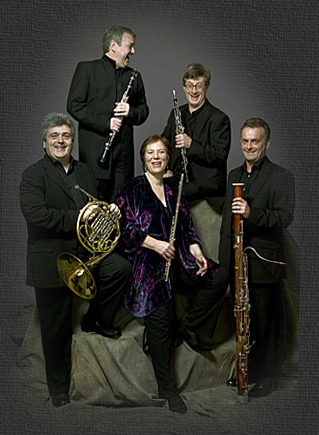 The group is flexible in its make-up, augmenting its five original principal members with top international pianists and chamber musicians for certain repertoire.In particular, London Winds have enjoyed close associations with pianists Stephen Kovacevich, Howard Shelley, Pascal Rogé, Barry Douglas and Boris Berezovsky. London Winds gave its highly successful début concert at the Wigmore Hall, London and continues to perform there regularly; in 1998 they celebrated their 10th anniversary with a critically acclaimed five-concert series, performing Mozart's major chamber repertoire for winds. Elsewhere in London recent performances include the South Bank Centre and at the Barbican Centre (as part of the BBC Janacek Festival). Regular guests at all the major British festivals, London Winds has performed at the BBC Proms, City of London, Edinburgh, Huddersfield, Bath, Aldeburgh, Edinburgh and Cheltenham festivals. UK appearances have also included performances at Bridgewater Hall, Manchester, the Aldeburgh Festival, the Wigmore Hall and at the Bath International Festival. Elsewhere in Europe, London Winds has performed in France (including at the Radio France Ligeti Festival in Paris and at the Rencontres Musicales d'Evian), Germany, Spain, Norway, the Netherlands, Italy and Scandinavia. They have also visited the USA (début tour in 1995), including the Newport Music Festival in Rhode Island (where they were the featured artists of the festival), the Bermuda Festival, and Canada (début tour in 1993). Other appearances in Europe have included a tour of Italy with Andreas Haefliger, a return to the Delft Festival in Holland, and two concerts in the Amsterdam Concertgebouw, one with Mikhail Pletnev. In Autumn 2000 the group visited Mexico for a week, giving masterclasses and individual recitals, as well as chamber music concerts. London Winds is renowned for its excellent interpretation of new music, and at the 1991 Norfolk and Norwich Festival they gave the world première of a specially commissioned piece for thirteen winds - by John McCabe. This work uses the same instrumentation as Mozart's Serenade for 13 Winds. A new commission by Robin Holloway for wind octet, was premiered at the Cheltenham International Festival in July 2001. Performances this season include appearances at the Concertgebouw, Amsterdam, the Bath Mozartfest and a major UK tour in the spring. London Winds has made several recordings including György Ligeti's complete wind music for Sony Classical as part of their Ligeti Edition, which won the Preis Der Deutschen Schallplattenkritik and was nominated for a 1999 Grammy. The ensemble has also recorded the complete set of Richard Strauss Wind Symphonies for Hyperion, and Beethoven's Quintet for Piano & Winds and Spohr's Septet for Decca, with Pascal Rogé and Chantal Juillet. The London Winds' latest release is an ONYX recording of Mozart's Serenade No.10 ('Gran Partita') and Mozart's Serenade in C minor.